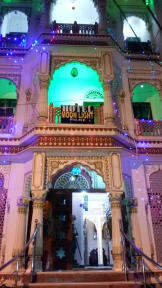 Hotel Moon Light Palace i Jaipur, Indien: Reservér nu! we need passport and visa details of foreigner they check in at reception. Hotel Moon Light Palace, Jaipur carrying on the same traditions of Royal Hospitality Designed along the lines of Traditional Haveli Touch with beautiful view from room balcony Hotel Moon Light Palace Jaipur. Also contain the most contemporary Standards in efficient comforts and Services. 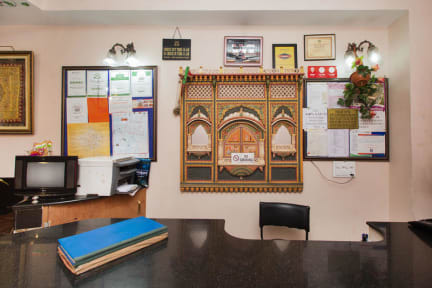 We offer pristine, comfortable and delightfully decorated rooms in a relaxed atmosphere and are dedicated in providing pleasant, friendly service. Our rooftop terrace offers stunning sunset and sunrise views of the spectacular Pink City. it is situated in a noise free atmosphere. We provide our guests with free pick-up service to take the hassle out of arriving in Jaipur, free welcome chai and free Wi-Fi. Near our Hotel have a public park so anyone want to do yoga or just walk for morning so they can go there and enjoy our time . We are looking forward to welcome you in our hotel and to give you a beautiful and relaxed stay in Jaipur!! Vores vigtigste mål er at give vores gæster et sted at slappe af og føle hjemme. Jaipur Fable Pink City med sine strålende farver og eksotiske monumenter, også velkendt for stor gæstfrihed. Hotel Moon Light Palace, Jaipur driver samme traditioner i Royal Hospitality Oprettet i retning af traditionelle Haveli Touch med smuk udsigt fra værelset balkon Hotel Moon Light Palace Jaipur. indeholder også de mest moderne standarder i effektive bekvemmeligheder og services. Vi tilbyder uberørt, komfortable og dejligt indrettede værelser i en afslappet atmosfære og er dedikeret i at yde behagelig, venlig service. Vores tagterrasse tilbyder en fantastisk solnedgang og solopgang udsigt over den spektakulære Pink City. det er beliggende i en støjfri atmosfære. Vi tilbyder vores gæster med gratis pick-up service til at tage besværet ud af ankommer i Jaipur, gratis velkommen chai og gratis trådløs internetadgang.